Every student after finishing 10th examinations will stand at crossroads in choosing their career. Most of the people have many thoughts about their career like which stream to choose, which board to select among others. Not only students but also their parents will be in dilemma to take decision regarding their child career. They will be surfing over internet, discussing with friends and others about the same. With many doors open the person struggle to choose the right door for right career. With many thoughts and suggestions, student will find difficult to come to a right decision. 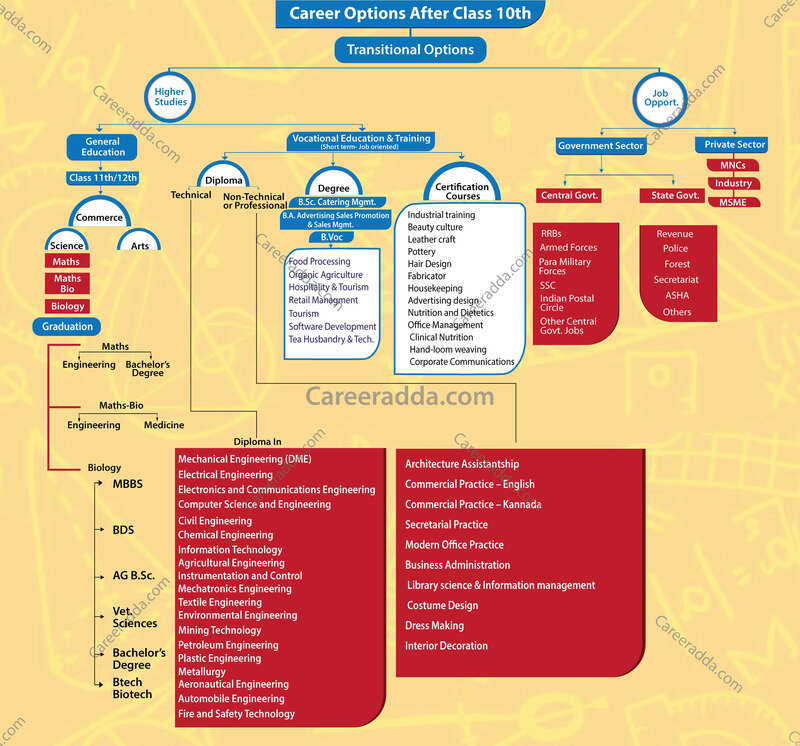 Here we clear your thoughts by analyzing different career options available after class 10th. 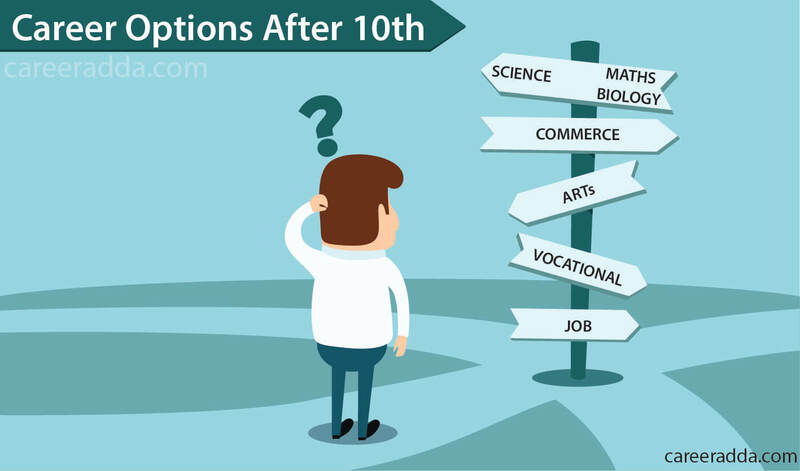 Selecting a right career path after 10th is not an easy task for students. Lots of career planning along with a proper workable plan is required. Student will be aware of certain things to make a successful career planning such as knowledge about his/her own interest, decision making ability, future objectives etc. Student and their parents must focus primarily on the interest of the candidate. They should be aware of various career options available and its relevance in today’s life and its suitability with the interest of the student. With many options, a person may end up in making a wrong decision. So it is very crucial to analyze each option according to the interest of the student. Parents may have their own interest about child’s career but ultimate interest of the student should be taken into consideration after proper discussion. You are at crossroads of your career after 10th and have to take decision to take your journey to the next level. There is a high probability to take wrong decision at this point as the person is not aware of available options and lack of right guidance or stress/ pressure because of the complex situation. One must take firm decision after gathering and analyzing information on career options as per their interest. Decision making is most after sought skill in anyone’s career at any point of time. Right decision drives you to the right way to achieve/ reach one’s dream. Discuss with your family, teachers and well wishers about career options, your interests, goals and dreams. Experienced persons might guide you better, so always give importance to the advice of parents, teachers and other experienced persons among your well wishers. Ultimately take a right decision as per your future objectives and goals by considering your strengths and weaknesses. The choice you make will decide your future and choice shape your career. Your actions should not decide your decision but your decision should decide your action. So make right choice as per your future goals and objectives. Take into consideration of your goals and give importance to most important ones and choose career option as per your priority of the goal. Infuse action into life to fulfill your dreams. The choice will make now will have consequences on your future, so be careful to make a right choice. Till your class 10th the subjects are common for all the students except the second language but after 10th there are number of options like mathematics, Biology, Commerce, Arts etc. One should choose any one option as per their interest and it will decide your future career as well. Many options lead to confusion and it will be difficult to decide the right option without knowledge. So by gathering information about all the options and by considering your interests, strengths and weaknesses along with future objective one should choose their best career option to continue their higher studies. After considering and deciding the option, the next step is selecting the board for 11 or 12th class/ intermediate. Many students select the board as per their 10th class board. But few want to choose different board from 10th class board like a student from any state board may take CBSE board for 11 or 12th class. If that is the case a student should consider the difficulties by choosing the other board as curriculum and standard of syllabus will be different for every board. It is possible to overcome these difficulties with hard work. CISCE Council for the Indian School Certificate Examinations Nongovernmental/ Private board of school education. Conducts ICSE and ISC exams. Choosing a job in either government or private sector. Science Stream with any of the available subjects is one of the most popular streams selected by candidates at 10+2 level. Science Stream allows a candidate to select any career option after 10+2. In addition to this, a Science Stream student can also come back to Arts or Commerce stream after 10+2/PUC i.e., at the graduation level. A Science Stream student can either go with conventional courses like medical, engineering, management or take up other available options like bachelors degree etc. Why Would You Choose Science Stream After 10th? To answer this question, we would like to introduce few impressive points to our readers. Science stream comes with end number of career options. From medical to engineering, a science stream’s student can take admission to any graduate or diploma programme/course and then can step in to the field of research. These days, several private and government companies & organizations are showing interest in hiring fresh faces of 10+2 science stream. In addition to this, India’s pride ‘Indian Armed Forces’ also recruits 10+2 science stream candidates on various permanent commissioned posts. For this, every year, IAF conducts a separate recruitment event. Commerce stream is another the most popular stream available out there. It is recommended for such students those love to trade business, want to be a part of a management board in any MNC etc. There is one issue with students having commerce stream at 10+2 level that they will not get a chance to change stream from commerce to science after 10+2. However, they can select a course in art field after passing 10+2 in commerce stream. Why Would You Select Commerce Stream After 10th? The answer to the above mentioned question would be best for students going to opt commerce stream at 10+2/PUC level because by reading the answer they will get a clear idea about career options after clearing 10+2 with commerce subjects. In present scenario, a commerce stream student can take admission to any degree or diploma programme/course having commerce subjects. In most of the commerce stream programmes accountancy, economics, business studies & business law are the key subjects. Few popular courses in which a 10+2 commerce stream’s student can take admission are CFA, CA, ICWA, CFP, B.Com, BBA, BMS, BBM etc. In most of these programmes, a student have to learn few major commerce subjects such as Business communication, Business economics, Marketing, Business law, Business finance, Auditing, Income tax etc. By doing these courses one should get settled in well recognized and valued posts. You can also select Art Stream after 10th i.e. 10+2 Art Stream. It is strongly recommended for those who have interest in learning challenging subjects such as History, English, Hindi, Political Science, Geography, Sociology, Psychology, Sanskrit etc. at 10+2/PUC level. These days, 10+2 Arts Stream has a wide range of subjects which can further offer brilliant career opportunities. Why Would You Select Arts/Humanities Stream After 10th? Selection of Arts Stream after 10th let you to pave the way for selecting few other gripping careers. If you have Arts Stream at 10+2 level then you can pursue a gold-winning career in any of the following fields- sociology, journalism, mass media, social service, history, economics, politics etc. Several other great career options are available out there for 10+2 Art Stream’s student. To know more career options after 10th in arts, you can get in touch with us by commenting below. Few other career options after 10th are given below. If you have passed 10th examination and want to do a job in any technical field then take admission to either ITCs or ITIs. In India, ITCs & ITIs is founded under the Ministry of Labour, Union Government of India. Privately-run ITCs and Government-run ITIs are such training organizations in India which offer training in technical fields. Every course’s curriculum/syllabus run at ITCs & ITIs is designed to impart basic skills required for a specified trade like plumber, turner, machinist, fitter, welder, electrician etc. The duration of each course is different and may vary from 1 to 3 years. After learning the course successfully, a candidate can join practical training in his/her trade. NCVT (National Council for Vocational training) also provides a NTC (National Trade Certificate) in the respective trade to such candidates who have cleared AITT (All India Trade Test). Candidates having a NTC can easily get a job in private as well as government sectors such as Indian Telecom departments, Indian Railways etc after qualifying a recruitment event. Along with above mentioned diploma courses, there are several other available out there. To know more about any diploma course, feel free to contact us. After 10th, candidates can also take admission to any certificate course according to his/her interest. Certificate courses available out there are mostly of 3 to 12 months duration. A certificate course of any duration will be an advantage for a 10th passed candidate. A certificate course after 10th will add impression to your CV/resume. Few certification courses offered by IGNOU are mentioned below. Certificate in Water Harvesting and Management etc. If you do not want to continue studies after 10th then you can go with this option. This option is recommended to such candidates who does not have interest in pursuing higher studies or they just want to earn good money as early as possible. Selecting a job option after 10th is not a bad idea as these days several government as well as private organizations are recruiting candidates directly after 10th. Power Corporation Limited of respective states etc. Along with above mentioned government organizations, there are several others in which a 10th passed candidate can get a job. However, they will need to go through a selection process to get a job in any government organization/department after 10th. Like government organizations, nowadays, private national and international companies also recruit candidates just after clearing 10th examinations. However, it is not as easy as you think. It requires lot of talent to get a job after 10th in any private company. To get a job after 10th in a private company, you should have interest and skills or any other exceptional talent in the relevant field. For example- if you are best in singing then you can approach relevant persons to get settled in the field. In present scenario, most of the national and international private companies are searching new talent. They run several campaigns and programs at school level to find and hire hidden talent and offers higher education or job as per skills. I hope this article is useful in clearing your thoughts and showing the path after 10th class for bright future of young talent. If you have any thoughts and ideas or queries, you can share with us and others by commenting below.